How often do you work without ANY nursing assistants/techs? A friend at a nearby facility said 2 of the CNAs that worked her usual schedule quit and they have since (approx a week) had no assistants at night often times unless there was an extra to be pulled from another floor...this is a hospital. I'm sure it must be rough!!! linearthinker has 25 years experience and works as a FNP. Every night. We haven't had techs at night for about 5 years. They have 1 on day shift from 9a-9p, but she is also the ward clerk and rarely gets away from the desk. Oh, but I'm not a floor nurse, this is critical care. 86toronado has 5 years experience and works as a RN-emergency. we rarely have a night tech on critical care either. maybe once a month... it's a rare luxury. in our med/surg area, they have a night tech most nights. maybe 2 nights a week without one. on days, however 2-3 techs is the norm. I was really referring to the units where having CNAs is the norm (med/surg, ortho, telemetry etc). They don't have any techs on our critical care units either. Work in a psych unit, which is a little different, but we need to have 15 pt before we get a tech. During the night it isn't so bad, but come morning if we have patients who need total cares d/t dementia or being catatonic, etc., it can get kinda hairy. On my ortho floor, we have 2 orderly shifts which overlap so we have coverage from 0700 to 2200. Outside of these hours, only nurses staff the unit and we normally have 6-8 patients on nights. On nights of higher acuity/workload justified/working short we can have an orderly staffed overnight but this is the exception not the rule. It waxes and wanes. I work midnights, so I'm used to not having a tech. We have hired some new midnight techs, but it's sitter season and we almost always have to sit our own cases. I work an ortho/med-surg floor we do primary care. When we have a tech it is because we are short a nurse and will be having to take a 6th patient. Its hard work getting a bunch of ortho patients to the bathroom but you do get to see your patients more often. NBMom1225 works as a RN. I work on a 36 bed oncology unit, and I think our matrix calls for 6 RN's and 4 or 5 techs if we're full on midnights...day shift gets 8 Rn's and I think 6 techs if we're full. I work on a med surg floor and we have no CNAs ot techs at all.We do primary care. We usually have one aide, three RN's for 18-24 patients on nights. It used to be 1 aide, 2 RN's. On days, two aides to four RN's plus a ward clerk for the same numbers; it used to be two aides to 3 RN's. Since the inception of a very poorly designed computer system, they have had to increase our staffing. 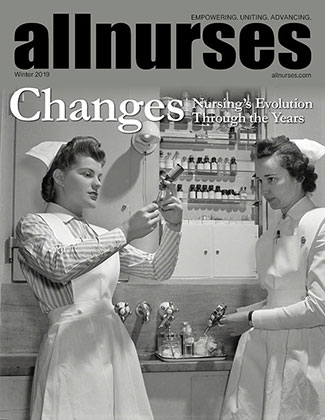 Our aides tend to be nursing students who spend more time trying to watch procedures and study than to do aide work. Some of them have already made sure we know that they are too good to work the floor....most plan to be nurse anesthetists or ARNP's. I already feel sorry for their future patients. But who knows? Time will tell. We are supposed to have 1 tech for a 29 bed ED. There have been many, many times when we have had to work with none if someone calls in or is on medical leave. In the 18 months that I have worked in the ED, 2 of our techs have been on medical leave a total of 5 times, so we have been short a lot.